If one common thread ties all transportation and logistics technologies together, it's the importance of integration. Implementing and executing scalable solutions that work in concert with existing processes and systems—as well as other peer technologies—is a priority for shippers and service providers. Why? Real-time data integration is a competitive enabler because it allows companies to conduct analytics, elicit business intelligence, and respond faster to supply and demand changes. Functional logistics solutions no longer exist in vacuums. In fact, they've helped steer decision-making away from siloed thinking. Companies rely on data and communication synergies that flow across myriad internal and external business operations all over the world. In today's supply chain, nothing is static. Economic fluctuations, shifts in demand and supply, new selling/sourcing strategies, growing supply chain sophistication, and countless other impulses have forced logistics technology to adapt—as a matter of function as well as deployment. Transportation and logistics service providers remain the go-to industry for technology vendors, especially as intermediaries continue to expand their value propositions with new solution capabilities. Nearly 90 percent of respondents to Inbound Logistics' Top 100 Logistics IT market research report sell to 3PLs, warehouses, carriers, and other intermediaries. 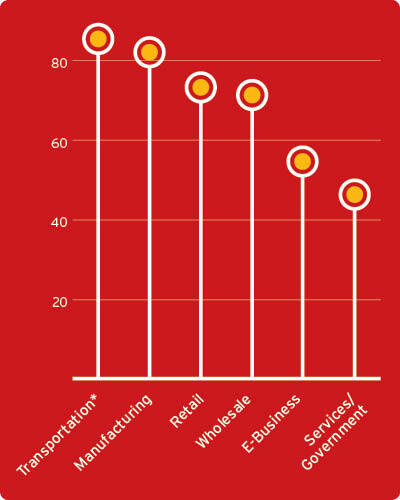 Manufacturing (86 percent) and retail (77 percent) are also top targets. E-commerce is one industry niche that is beginning to show signs of marked growth as solutions companies develop technology specifically for online fulfillment. With Amazon having thoroughly democratized Internet selling, retailers ranging from mom-and-pop shops to High Street department stores are exploring opportunities to seize the market themselves. Whether a start-up, niche brand, or brick-and-mortar seller, the logistics technology industry is adapting to buyer need. Seventy-five percent of polled IT companies are targeting wholesale, while 58 percent serve the e-commerce space. Today's transportation, logistics, and supply chain technology market features much greater parity in terms of the percentage of IT vendors that serve up a specific product. No single type of technology runs away with demand. 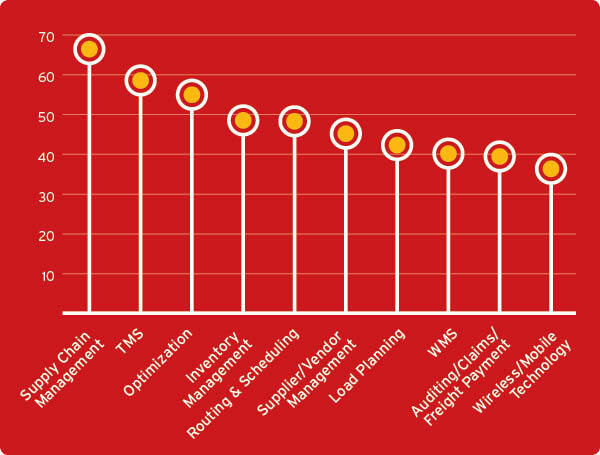 Supply chain management is the most common solution offering, with 70 percent of survey respondents providing that capability, followed by TMS (62 percent), optimization (59 percent), and inventory management and routing & scheduling (both 52 percent).